Galaxy S5 Sport, New Device From Sprint And Samsung! Samsung (and Apple) are pushing the health and fitness market hard, viewing this marketplace as another opportunity to take sales away from rivals. And the #3 U.S. Carrier Sprint, acquired last year by the Japanese firm Softbank, is looking to grow its subscriber base and market share in the U.S., in part by offering exclusive phones that aren’t available on other carriers. This is a tactic AT&T and Verizon have long used, and with Softbank’s money behind them Sprint can now follow their lead. In a development which benefits both companies, Sprint has teamed with Samsung and fitness industry leaders Under Armour and MapMyFitness to announce the availability of the Galaxy S5 Sport, a mobile solution for active people designed to support their energetic lifestyles. Much like the Galaxy S5 Active, the new device features 3 hard keys on the front for easier use during sports activities. It also has a rubber edge to provide a better grip on the phone. And while it keeps the IP67 certification for water resistance and dust proofing of the regualar S5, the S5 Sport is not a ruggedized device like AT&T’s S5 Active. From a hardware perspective, other than the changes mentioned above, the Galaxy S5 Sport has the same textured back as the original device and the same specs. These include the 5.1 inch Super AMOLED screen, 1080p resolution, 2.5 GHz CPU, 2GB of RAM and a 2800mAh battery. 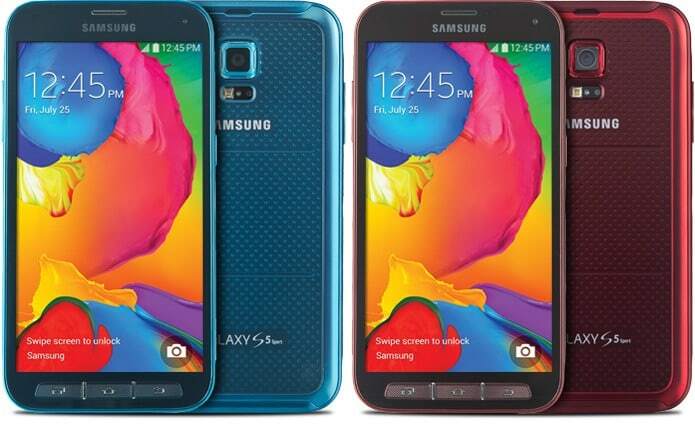 The phone ships with Android 4.4 KitKat, and is available in Cherry Red or Electric Blue. A consolidated view of all fitness information. Acesss to MapMyFitness, which allows you to track, monitor, and share workout activity. MapMyFitness MVP, which includes premium content such as customized audio coaching, training plans, live tracking and more is provided for free for 12 months. MapMyFitness is a wholly-owned subsidiary of Under Armour, a leading sports, fitness and performance brand. Access Spotify Workout playlists with free Spotify premium for six months for customers who are on Sprint Framily plans or three months for other Sprint customers. Live the Healthy Lifestyle by receiving updated smart, contextual health and fitness content. Customize the look and feel of fitness tracking, education, music and healthy living content displayed on the wallpaper or in a full screen experience. Purchasers of the GS5 Sport can also save $50 on the purchase of a Samsung Gear Fit. The MapMyFitness software will be available on the Google Play Store later in 2014, although without the free premium content available to purchasers of the S5 Sport.